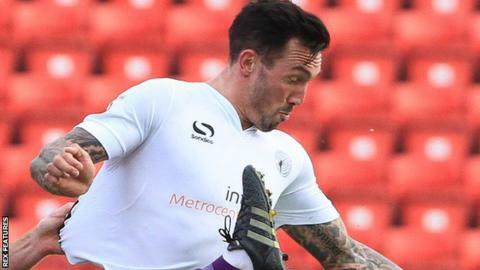 Ryan Bowman scored twice as Gateshead sealed a comfortable victory over Guiseley in the National League. The Tynesiders had lost their last two home fixtures, but Bowman opened the scoring straight after the break with a close-range finish. He doubled the lead after CJ Hamilton's initial effort was saved, and Danny Johnson wrapped it up with a neat finish at the near post. The win put Gateshead 12th in the table, six places above the visitors. Match ends, Gateshead 3, Guiseley 0. Second Half ends, Gateshead 3, Guiseley 0. Tom Craddock (Guiseley) is shown the yellow card for a bad foul. Hand ball by Tom Craddock (Guiseley). Attempt missed. Ryan Bowman (Gateshead) header from the right side of the six yard box is too high. Assisted by George Honeyman. Goal! Gateshead 3, Guiseley 0. Danny Johnson (Gateshead) right footed shot from the left side of the box to the bottom left corner. Assisted by CJ Hamilton with a cross. Attempt blocked. Danny Johnson (Gateshead) right footed shot from the left side of the box is blocked. Attempt missed. Danny Johnson (Gateshead) left footed shot from the right side of the box misses to the left. Assisted by Patrick McLaughlin. Attempt missed. Nicky Boshell (Guiseley) left footed shot from outside the box misses to the left. Substitution, Gateshead. George Honeyman replaces Matty Pattison. Attempt missed. Oliver Norburn (Guiseley) right footed shot from outside the box misses to the left. Attempt saved. Gavin Rothery (Guiseley) header from the left side of the six yard box is saved. Assisted by Adam Boyes. Attempt blocked. Nicky Boshell (Guiseley) left footed shot from outside the box is blocked. Patrick McLaughlin (Gateshead) is shown the yellow card for a bad foul. Hand ball by Rob Ramshaw (Gateshead). Substitution, Guiseley. Tom Craddock replaces Danny Boshell. Jordan Cranston (Gateshead) is shown the yellow card for a bad foul. Goal! Gateshead 2, Guiseley 0. Ryan Bowman (Gateshead) right footed shot from the right side of the six yard box to the bottom right corner. Assisted by CJ Hamilton. Attempt blocked. Ryan Bowman (Gateshead) right footed shot from the right side of the six yard box is blocked. Substitution, Guiseley. Nicky Boshell replaces Adam Smith because of an injury. Attempt missed. Ryan Bowman (Gateshead) header from the left side of the six yard box misses to the right. Assisted by CJ Hamilton with a cross.